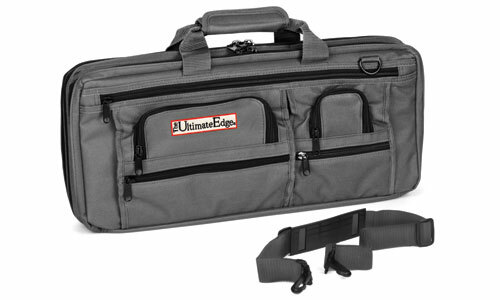 Ultimate Edge manufactures premium quality knife luggage. The details in their work make these the most recommended brand for professionals. Double stitching, premium zippers, embedded reinforcement patches are amongst the many subtle distinctions that make these the most wear-resistant bags on the market. 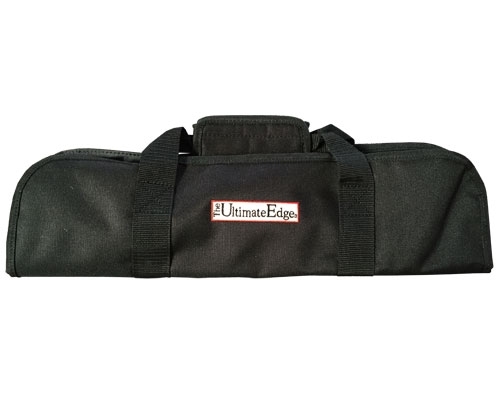 Basic Black Ultimate Edge Knife Bag with 5 Slots for Knives. No additional pockets. 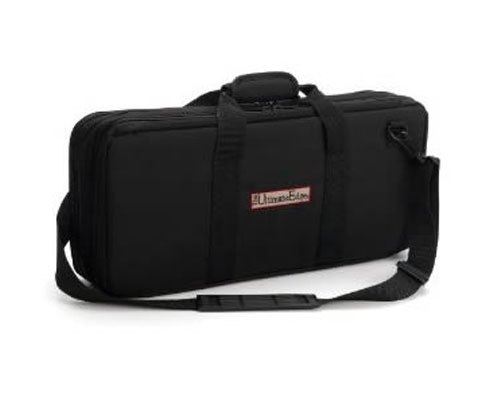 The Ultimate Edge Evolution Deluxe 18 Slot Knife Case in black has outside pockets that can easily fit your cell phone, pens, business cards, cigarettes, etc. Extremely durable and well made - zippers operate smoothly, all pockets are stitched well and the material is ultra heavy-duty. Carrying strap included. 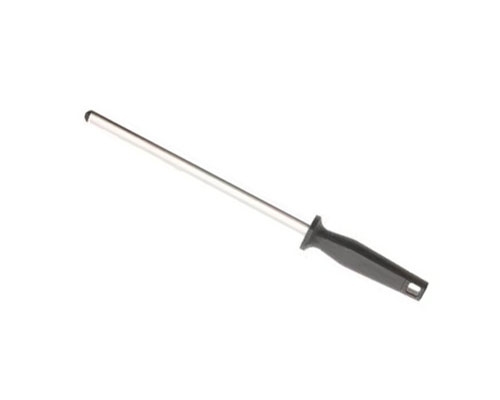 Thickness (without product in bag): 2 in. 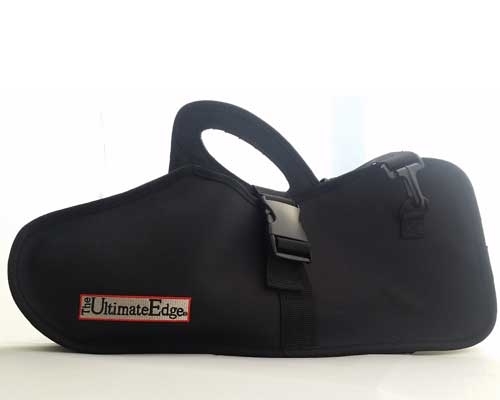 The Ultimate Edge Chocolate Evolution Deluxe 18 Slot Knife Bag features pockets on the front of the bag that easily fits your cell phone, pens, business cards, cigarettes, etc. This durable bag is made of high density cut resistant nylon denier cloth, and has heavy duty clips and double-stitched seams. Carrying strap included. 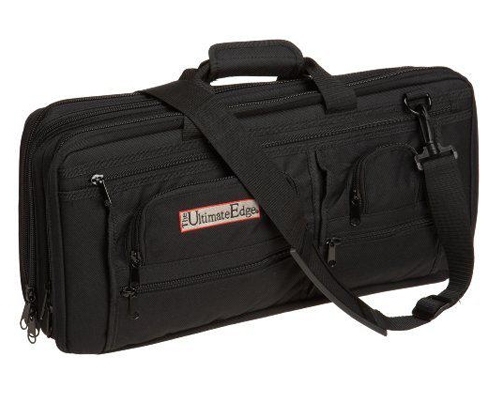 The Ultimate Edge Graphite Evolution Deluxe 18 Slot Knife Bag features pockets on the front of the bag that easily fits your cell phone, pens, business cards, cigarettes, etc. This durable bag is made of high density cut resistant nylon denier cloth, and has heavy duty clips and double-stitched seams. Carrying strap included. 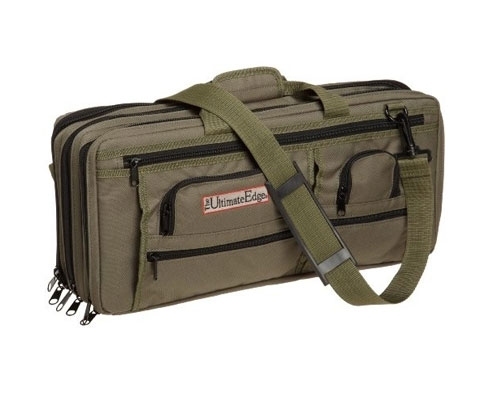 The Ultimate Edge Evolution Deluxe 18 Slot Knife Case in olive has outside pockets that can easily fit your cell phone, pens, business cards, cigarettes, etc. Extremely durable and well made - zippers operate smoothly, all pockets are stitched well and the material is ultra heavy-duty. Carrying strap included. 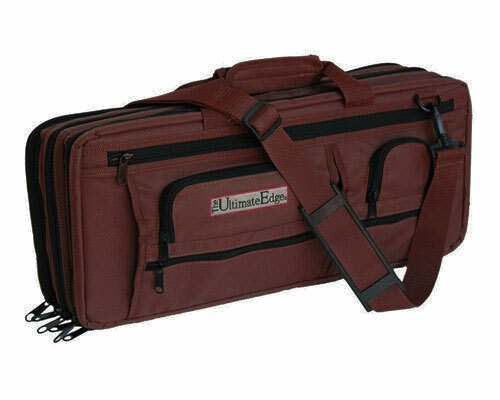 The Ultimate Edge 18 slot Evolution Knife Bag is not the same as the Evolution Deluxe knife bags. This model does not feature pockets on the front. The best bag for carrying a large assortment of tools. Three zippered compartments in total. The first two hold knives and garnishing tools on both sides, with the slots at opposite ends of the bag so that they lay flat. 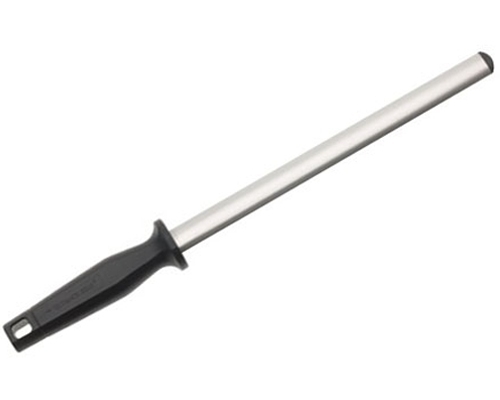 A nylon flap lays between to insure that your knives and tools won't rub up against each other. The third compartment has one large and two small zippered pouches for storing miscellaneous items. The Ultimate Edge 2001-REV chef's luggage is a revolutionary way to transport your cutlery. Designed to stand alone within your workstation this bag eliminates the need to constantly shuffle products to and from your traditional knife roll. This case will accommodate blades up to 12 in. in length. 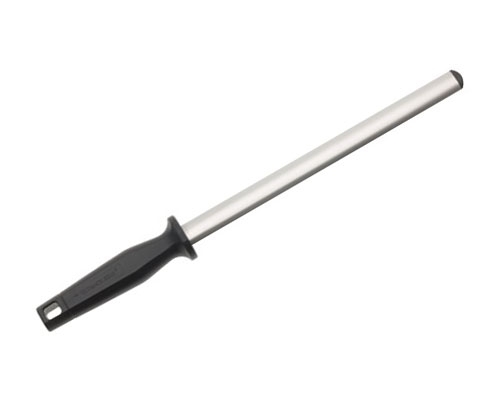 The Ultimate Edge 10 in. Wide Diamond Steel (600 Grit) has a 3/4 inch oval surface that provides lots of surface contact, so fewer strokes are needed to sharpen your knife. Hollow tubing is light and saves money. There is no benefit to a solid steel with laminated with diamonds other than the heavier "feel." Made in the USA.